Do you like the taste of kale? While kale is an exceedingly healthy vegetable – it is super-rich in vitamins, minerals and fibre - it can be somewhat challenging taste-wise. I have met people who love it but I need more persuasion so I’ve been looking for ways to make kale more palatable. This crispy kale salad fits that brief. Like most vegetables, kale is best eaten raw or steamed. I sometimes use raw kale together with basil, walnuts, garlic and parmesan to make pesto and find it really tasty. Or I add it to a soup at the very end of cooking time and then use a hand blender to make a smooth soup. To make this crispy kale salad though, I toss the kale (I use curly kale) with some olive oil and oven-roast it for 10 minutes, until it is really crispy and quite brittle. Kale is a very good source of vitamin K (said to be good for bone density and to help lower blood pressure) and dietary fat like olive oil enhances the absorption of vitamin K.
Chickpeas are rich in protein and fibre which help you to feel full on less. They are also a good source of different minerals and can help to lower cholesterol levels. This salad will give you chickpeas two ways as I add both fried chickpeas with cumin (they are great as a snack on their own) and hummus. And to top it all off I add healthy beetroot as well. I love the contrast between the crispy kale, fried chickpeas and earthy and juicy beetroot. As I use cooked beetroot in natural juices I can get this salad ready reasonably quickly. You can serve this as a side dish, or as a light meal together with toasted pita bread. Pre-heat the oven to 200C/Fan/180C/400F/gas mark 6. Cover a baking tray with baking parchment. Place the kale on the tray, drizzle over half a tablespoon of olive oil and toss. Once the oven is hot, place the tray in the oven and roast for 10-12 minutes until the kale is really crisp. While the kale is roasting, add one tablespoon olive oil to a large frying pan over a medium-hot heat. Once the oil is hot, add the chickpeas and cumin to the pan and stir. Season with sea salt and black pepper and stir every now and then for about 2-3 minutes. Take the pan off the heat. 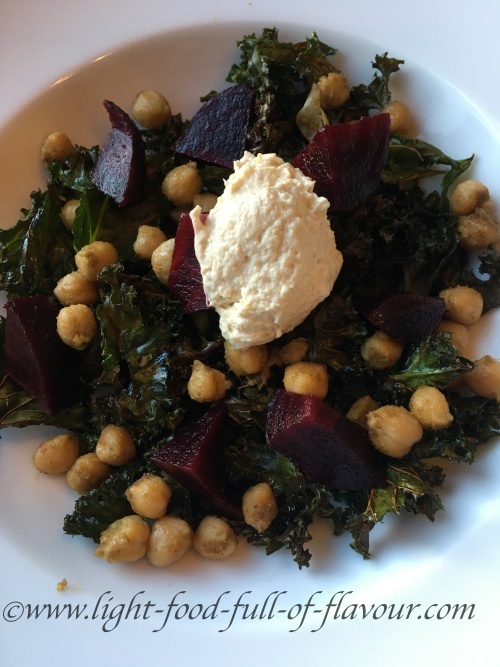 Divide the roasted kale between 2-4 plates and top with the cumin-fried chickpeas, chopped beetroot and a dollop of hummus.